Cousin Lois has done it again. Her comments always set me thinking. She recommended a book, “1066: The Hidden History In the Bayeux Tapestry,” by Andrew Bridgeford. I haven’t seen the book yet, but I launched into the subject on Wikipedia and other Internet sources about the so-called Norman Conquest of England, by William the Conqueror in 1066. A bloody year in a bloody century, to be sure, and one of the most studied periods in medieval history. William*, you may recall, is my 28th great-grandfather, genes courtesy of my mother. Just to refresh your memory, in October of that year, William’s forces defeated and killed the last Anglo-Saxon king, Harold Godwinson, in the Battle of Hastings. 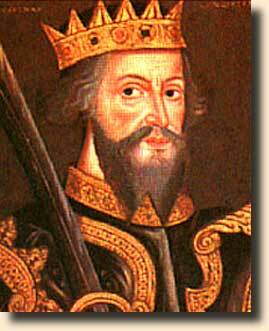 Note that even though he was Anglo-Saxon, the king is known by a Scandinavian-style surname; indeed, his mother was a Danish princess. Of course, the Normans themselves were descended from Danish Viking settlers in Normandy, but that is another story. Well here is a tidbit I got for my efforts: A different battle, a month before the fateful Battle of Hastings, brought by a third claimant to the English throne, himself another ancestor of mine! I speak of Harald III “Hardrada,” king of Norway. Harald of Norway had invaded England, in collusion with Godwinson’s estranged brother, Tostig. Harald’s claim to the English throne was weak, but so were those of the other two pretenders. The invasion, however, ended in a debacle that for many historians marks the end of the entire Viking era. In September 1066, Harald was in his turn defeated and killed, along with Tostig Godwinson, at the Battle of Stamford Bridge, by the forces of Harold Godwinson. (In fact, control of much of England had swung between Anglo-Saxon and Viking for over two centuries.) Although they had crushed the Norse invaders, it could be argued that Godwinson’s army was weakened by its battle with the Vikings, and less fit to battle the Normans. I just mention this because Harald Hardrada is another 28th great-grandfather, thanks to my father’s (Lovell’s) mother, Anna Moen. Oh, and by the way, Harald III Hardrada is also a half-brother of Olaf II, famed in Norsk circles as Saint Olaf, patron saint of Norway. Oh, and also, Saint Olaf is my 29th great-grandfather, due to a marriage several generations later between descendants of Harald and Olaf. I guess this helps balance with my “other” ancestors: the peasants and the potato-thief. *Note that each link above is unique; that is, if there are two links on a particular subject, such as “Anglo-Saxon,” they lead to two different articles. It is for me a source of amusement and fascination that so many historic world leaders are among my ancestors. (e.g. Marc Antony, William the Conqueror, Saint Olaf, Eleanor of Aquitane, etc. etc.). In trying to write about them in a way that illustrates their importance to Western “civilization,” I hope I haven’t given you the impression that I admire them or their accomplishments, or even approve of them. To achieve what they did, I know they had to be ruthless, cruel, and corrupt, most often in direct proportion to their power and importance. In a world where the accepted path to influence was military conquest, if a leader had the means to subjugate his neighbors by force, then in the name of lifting up his people, he was expected to do so. That does not mean it was morally justifiable even then, only that it was “how things were done.” One point in respect of these ancient leaders: they were in the thick of their battles, risking their own lives alongside their soldiers, unlike the powerful leaders of the present era. I dream of a different world, where leaders have learned that our collective survival depends on cooperation and compassion across all lines of language, race, and religion, not on the superiority of armaments and killing power of one neighbor versus another. Now that I have set the record straight on that, there are one or two more of these “king” guys I want to tell you about. Harold Godwinson, Tostig Godwinson, and Harald Hardrada: all ancestors of Lovell Larson via Anna Moen, through various branches of the Fairhair dynasty of Norway. Nordic ski racers and fans recognize the name as that of a demanding 54-kilometer race with events in Norway, Canada, and Wisconsin, USA. The name comes from a political faction contending for power during Norway’s century of intense civil wars (1130-1227). During the multiple conflicts, forces coalesced into two main parties. The Bagler party, centered in Oslo, enjoyed the support of the Church, and superior military strength (most of the time), while the Birkebeiner were popular among the farming communities of inland Norway, and the fishermen and mariners of the Atlantic coast. Their name comes from the birch bark they used (according to legend) to protect their feet and legs, as many were too poor to afford protective armor or footwear. So what, you may ask, is the connection to the sport of Nordic ski racing? It is a journey in January of 1206 to rescue a young prince from the oncoming Bagler army. When King Haakon III Sverresson (a Birkebeiner) died on 1 January 1204, he left no legitimate heirs to his throne. Late the following year, an untitled woman named Inge of Varteig came forward with a young son whom she claimed was conceived with King Haakon a few months before his death. Her claim was corroborated by several associates of the late king, and eventually Inge successfully underwent a trial by ordeal, the 13th-century substitute for DNA testing. This development was not taken well by the Bagler, who sent a force of soldiers to find and kill the boy. During Christmastide, as the contingent closed in on his hiding place at Lillehammer, a small group of Birkebeiner warriors set out on skis, carrying the toddler, in a daring midwinter rescue attempt. Beset by daunting blizzards, unable to use the less formidable route via Gudbrandsdalen, only the two strongest warriors were able to complete the journey, bringing the eighteen-month-old safely to the Birkebeiner capital city of Nidaros (Trondheim). The rescue is depicted in this famous 19th-century painting, and is re-enacted in costume at some of the modern sports events. The boy succeeded to the throne in 1217, skillfully consolidated his power during the next decades, eventually reconciling with the Bagler and ending a century of civil strife. The details of how the Birkebeiner chose Haakon over two other pretenders, I can only find in Norwegian. But this link will I hope bring up a partially usable Google translation. The same article is also the only detailed look at Inge of Varteig. Under Haakon IV Haakonsson, Norway arguably assumed as much importance on the European stage as it had enjoyed even during the Viking era, since it was now a unified nation, rather than a handful of squabbling, if powerful, petty kingdoms, as in the heyday of the Vikings. Eager, it seems, to restore some of the Viking glory, Haakon sailed to Scotland, captured the northern islands, and launched an invasion to reclaim the mainland. However, his fleet was pounded by storms, forcing a retreat to the Orkney Islands, where he fell sick and died in December of 1263. After his death, the status of Norway again gradually declined. The plague, or Black Death, in the mid-1300’s killed as much as half the population. Norway was merged by royal marriage with Denmark in 1380. The royal line died out, and Norway ceased to be an independent country for more than 500 years, until 1906. The core of this period was dubbed by Henrik Ibsen “the 400-year night.” Perhaps not coincidentally, the period from approx. 1400-1800 is now known by climatologists as the “Little Ice Age,” due to exceptionally cold weather throughout Europe. And the punch line … Haakon IV … my 22nd great-grandfather. I just read “The Pretenders,” a play by Henrik Ibsen. It is a fictional account of the tortured relationship between Haakon IV and Earl Skule Baardsson, who was chosen by the Birkebeiner council to rule as regent for Haakon until he came of age, and to permanently rule 1/3 of the kingdom. By some accounts, it was Skule who actually accomplished many things that are usually credited to Haakon. Years later, Skule Baardsson ended up rebelling and being put to death, and Ibsen makes a great fiction of it, complete with an arch-evil bishop (or was it an evil archbishop?). The opening scene is the mother’s trial by ordeal, which in the play is just the first of many ordeals. I have been given a middle name, Godwin, it has been given to the first born son in my family since Saxon times. It probably means we were slaves to Godwinson, and which of them I am not sure. Strangely, I now find I am living in a small village in Lincolnshire called Haconby, in a house called Haakon House! Thanks for the comment. Your Viking roots run deep, it seems. Before the Godwinsons came Godwin, first Earl of Wessex, vassal of Cnut the Great of Denmark. Your ancestors may well have been slaves of the “original,” possibly even interbred with the family. As for Haconby and Haakon House, you may know they are possibly named after Haakon the Good (just how “good” is open to debate), a Viking prince who spent time in England as a youth, then went on to conquer his half-brother Erik Bloodaxe(!) to become the third King of Norway in c. 953 CE. Haakon was the first king to attempt (unsuccessfully) to introduce Christianity to Norway.